Happy St. Lucia's Day! 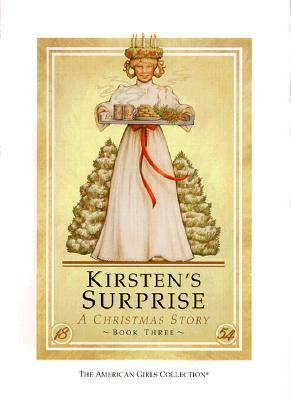 Most Americans don't celebrate (or even necessarily know what it is) and I probably wouldn't either if it weren't for my beloved American Girl Doll stories featuring Kirsten, who appealed to me because I'm partly Swedish too. The celebration involves the stories of St. Lucia, who supposedly gave all her wealth to the poor and was martyred for her faith. It's also a celebration of light, as most celebrations around the Winter Solstice tend to be, and would be especially appreciated in Scandinavia with so little sunlight this time of year. The traditional costume involves a wreath of candles worn on the head, because St. Lucia needed both hands free to bring food and supplies to Christians hiding in the catacombs. Yet there's a different Lucy character in Scandanavia, Lussi. From Wikipedia: "Lussinatta, the Lussi Night, was marked in Sweden 13 December. Then Lussi, a female being with evil traits, like a female demon or witch, was said to ride through the air with her followers, called Lussiferda. This itself might be an echo of the myth of the Wild Hunt, called Oskoreia in Scandinavia, found across Northern, Western and Central Europe. Between Lussi Night and Yule, trolls and evil spirits, in some accounts also the spirits of the dead, were thought to be active outside. It was believed to be particularly dangerous to be out during Lussi Night. According to tradition, children who had done mischief had to take special care, since Lussi could come down through the chimney and take them away, and certain tasks of work in the preparation for Yule had to be finished, or else the Lussi would come to punish the household. The tradition of Lussevaka – to stay awake through the Lussinatt to guard oneself and the household against evil, has found a modern form through throwing parties until daybreak. Another company of spirits was said to come riding through the night around Yule itself, journeying through the air, over land and water." I love the Lussi legend! I've sent a link to a workmate called Lucy. Heard about this off of a Mickey Mouse Christmas cassette tape back when I was kid. Still pretty interesting. Yikes! The Lussi/Lussiferda legend is scary! My name is Lucia!! !